In Tibet, A Long-Banned Buddhist Rite Takes Place, But Not Everyone's Pleased : Parallels The Beijing-selected Panchen Lama is conducting a key Tibetan Buddhist ritual. It's the first time in 50 years the rite has taken place in Tibet. Critics say that's because China wants more control. 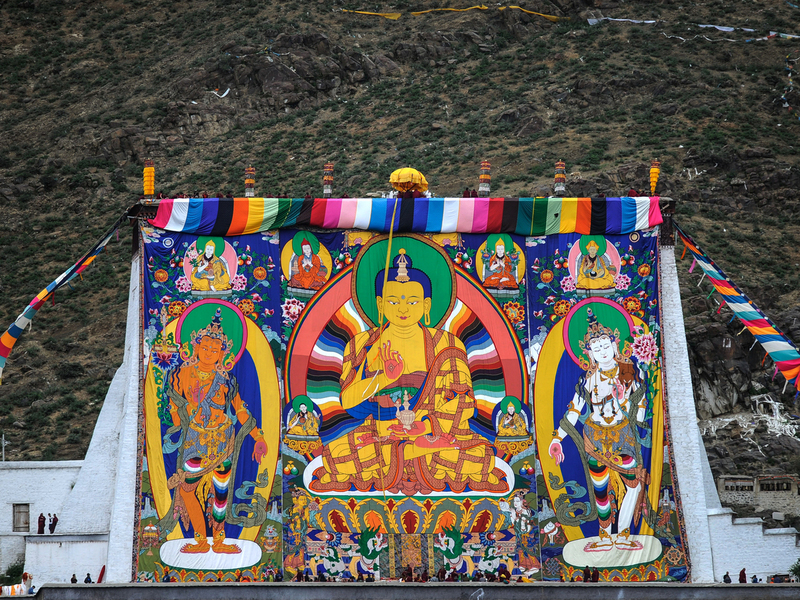 A Buddha portrait or thangka is unveiled during a ritual event in Tibet. China's hand-picked Panchen Lama is presiding over the Kalachakra Initiation, a key Buddhist ritual being held in Tibet for the first time in 50 years. The Panchen Lama — the second highest figure in Tibetan Buddhism after the Dalai Lama — is performing an important ritual that has not taken place in Tibet for half a century, Chinese state media are reporting this week. In this elaborate, 12-day event, known as the Kalachakra Initiation, some devotees visualize themselves exploring a five-story palace. At the center of the palace is a green lotus petal, and on it is said to reside the Kalachakra deity, with blue skin, four faces and 24 arms. On Friday, China's official Xinhua News Agency reported that some 50,000 faithful are expected to attend the Kalachakra Initiation at the Tashi Lhunpo monastery in Xigaze, Tibet, the traditional seat of the Panchen Lama. The ritual, which ends on July 24, is apparently being conducted with the blessing of China's ruling Communist party, despite the fact that the government is officially atheist and has traditionally held the Marxist view that religion is the "opium of the people." Previously, the ritual was forbidden to take place in Tibet but had taken place in Tibetan areas outside Tibet. The Panchen Lama, selected by Beijing, is a controversial figure among Tibetans. Those living in exile in India and elsewhere are denouncing this month's ritual as a sham. They see it as an attempt by Beijing to legitimize this Panchen Lama as the government's proxy and cement its grip on Tibet and its main religion. Tensions between Tibet and the Chinese government have simmered since the 1950s and sometimes boiled over, as Tibet has sought independence from China or rebelled against its heavy-handed rule. Robert Barnett, director of Columbia University's Modern Tibet Studies Program, sees Beijing's move to hold the ritual this month in Tibet as part of "a long-term strategic plan by the Chinese authorities to try to outmaneuver the Dalai Lama by creating some sort of replacement figure." 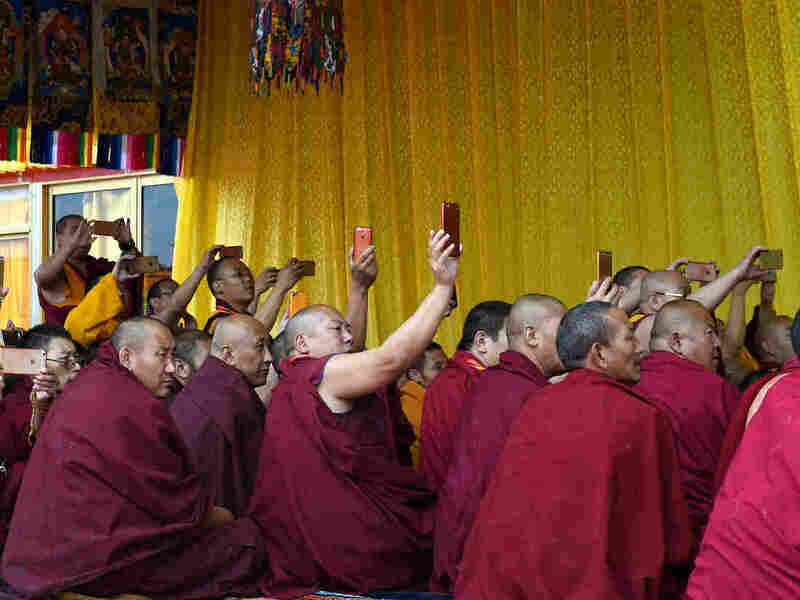 In a photo provided by China's Xinhua News Agency, Tibetan monks take smartphone pictures during the Kalachakra ritual in Tibet. Beijing sees the Dalai Lama, now 81, as a dangerous enemy, working under the cover of religion to split Tibet from China — which has ruled the Himalayan territory since 1950. Historically, the Dalai Lama and Panchen Lama have played roles in selecting each other's reincarnations. The Chinese government insists that after the Dalai Lama dies, his incarnation can only be found inside China's borders. 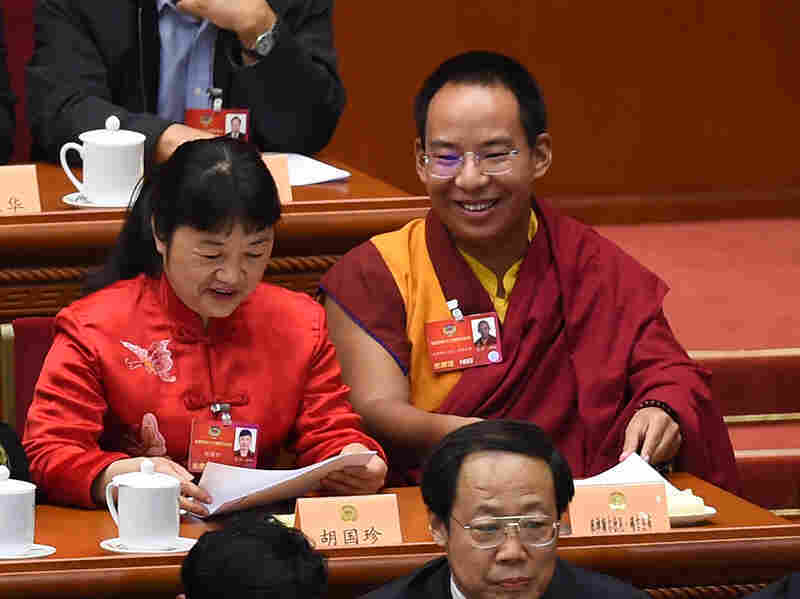 Observers believe that Beijing is preparing the Panchen Lama to help select the next incarnation of the Dalai Lama, who would be subservient to Beijing. The Dalai Lama has mentioned the possibility that he will stop reincarnating. Beijing says that would go against Buddhist rules and tradition. To be sure, the politics of the transmigration of souls is mind-boggling stuff. But what Barnett finds even more incredible is that China's leadership, it seems, "can't rule Tibet without a lama who is their proxy leader." Nobody in Beijing, he says, seems to be asking the question: "Well, couldn't we manage without having a lama?" The Chinese government-selected Panchen Lama, Gyaincain Norbu (right), took part in the Chinese People's Political Consultative Conference in Beijing on March 14. One problem with trying to rule by proxy, Barnett points out, is that so far it simply hasn't worked. Tibetan Buddhism's three highest clerics — the Dalai Lama, the previous incarnation of the Panchen Lama and the Karmapa — were all initially persuaded to cooperate with Beijing in the 1950s and 1960s. And in the cases of the top two, to hold symbolic posts in the Chinese government. But all three eventually changed their minds. The Dalai Lama fled to India after a failed Tibetan uprising in 1959 and two incarnations of the Karmapa fled Tibet in 1959 and 1999, respectively. The previous Panchen Lama was jailed or kept under house arrest for nearly 15 years. All became critical of Chinese rule in Tibet. The Chinese government has not succeeded in keeping any top lama loyal for longer than the current Panchen Lama, who was selected 21 years ago. Many Tibetans who remain loyal to the Dalai Lama consider this Panchen Lama an impostor. In 1995, representatives of the Dalai Lama and Beijing at first cooperated on selecting the current incarnation of the Panchen Lama. The Dalai Lama's representatives named their candidate first. Then Beijing declared its own choice, a boy named Gyaincain Norbu, as the true reincarnation. The Dalai Lama's pick disappeared and has never been seen in public since. Beijing insists he's just an ordinary young man who is living a normal life and does not want to be bothered by the public. Critics say he is a political prisoner. The Dalai Lama has never recognized Beijing's choice. Analysts point out, however, that other Tibetans' attitudes toward the Panchen Lama are complex. Many believe that whether or not he is the true incarnation of the Panchen Lama, he is at least an important lama, and therefore worthy of respect. Last year, some Tibetans thought the Panchen Lama might be having second thoughts about his role when he publicly called for the government to relax restrictions on the number of monks and nuns allowed to live in Buddhist temples and monasteries in Tibet. Beijing has limited the number of monks and nuns who are allowed to reside in temples. As of 2015, there were 46,000 lamas in Tibet, according to Qin Yongzhang, a Tibet expert at the Chinese Academy of Social Sciences in Beijing. That's less than half of the number in 1950. While it's impossible to tell what the Panchen Lama really thinks about his role, Barnett says it's clear that "this man himself has no say at all, it seems, in whether he gets to play that role. He's a prisoner in a gilded cage." Qin says that the government realizes that some monasteries are short of monks, and has begun to recruit and train more of them. He argues that the shortage of monks is due to the fact that many young Tibetans "want to enjoy the fruits of modernization," rather than entering a monastery.